After completing an audit of the Western Connecticut State University (WCSU) website (which can be found here), 3PRIME and Studio 63 were asked to take further steps in helping WCSU create a consistent brand presence across the entire university website. The goal of the design was to create and experience that would foster a sense of trust in the brand and encourage prospective students to apply to WCSU while making information readily available and easy to find for current students and other stakeholders. After interviewing and gathering information from a variety of university faculty members including professors, department heads, and administration 3PRIME and Studio 63 worked collaboratively on a set of design options. These options were built specifically to convey the message and tone WCSU requested as well as create a positive and intuitive experience for the user. For the site design 3PRIME and Studio 63 focused on a variety of areas in which WCSU, in designing a new website, should focus their efforts. These areas were broken down into two basic categories. Technical aspects of the site and user and audience experience improvements. 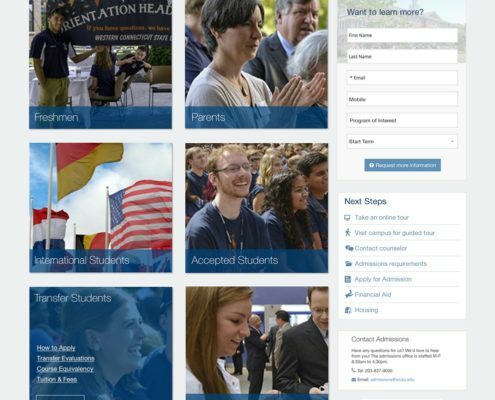 In order to showcase design improvements in action, 3PRIME and Studio 63 designed a variety of pages incorporating user experience suggestions as well as designing systems to further the overall goals and conversions of the WCSU website and brand. This was all done while making recommendations for ease of implementation and use for content owners throughout the university hierarchy.